These three charts say it all. Small-cap biotech stocks tend to be all-or-nothing propositions. If the company's lead compound fails during a pivotal clinical trial, then shares can flame out in spectacular fashion. On the other hand, companies that are able to survive the regulatory gauntlet and successfully bring a new drug to market can turn into wonderful long-term investments. One company that looks quite promising is Acadia Pharmaceuticals (NASDAQ: ACAD), a San Diego-based biopharmaceutical company that focuses on disorders of the central nervous system. Acadia has been one of the best-performing stocks on the entire market over the past few years, and any investors who was smart enough (or lucky enough) to pick up a few shares five years ago are currently up a mind-boggling 1,600%. That performance has dwarfed the returns of even the red-hot biotech sector, as measured by the SPDR S&P Biotech ETF, which itself is up a blistering 138% over the same time period. Investors having been bidding up shares, as the company could finally be on the verge of transitioning from a clinical-stage company into a commercial enterprise. So, what do the bulls know about this company? Below are three charts that can help explain the thesis behind Acadia's stock. Acadia's bulls seem to be convinced that the company's lead compound -- Nuplazid -- will win FDA approval. Nuplazid has been submitted as a potential treatment for Parkinson's disease psychosis, or PDP, a disorder that affects roughly 40% of patients who have Parkinson's disease. PDP causes these patients to hallucinate and have delusions that deeply affect their quality of life and also greatly increases the burden placed on caregivers. Since there are one million people in the U.S. alone with Parkinson's and no approved therapies on the market, this disease is a huge problem. Cue Nuplazid. In clinical trials, Nuplazid was shown to be effective at helping to alleviate many of the symptoms of PDP, and it did so in a safe and effective manner. Of equal importance was that patients who used Nuplazid did not have their motor control comprised, which is a typical side effect of many antipsychotics. Naturally, when these results become available, shares skyrocketed, making Acadia the best-performing biotech stock of 2013. Peak sales estimates for Nuplazid currently run in excess of $3 billion. Right now, all eyes on are the Nuplazid opportunity in treating PDP, but there may be other uses for the drug, too. Acadia is currently running trials testing its ability to treat Alzheimer's disease Psychosis and Schizophrenia. Beyond that, the company has two other compounds that are in early and mid-stage clinical trials at the moment. Way back in 2003, the company signed a collaboration deal with pharma giant Allergan with the goal of developing new therapies. So far, that deal hasn't turned into much, but the two companies are currently advancing a drug that's aimed at treating chronic pain down the regulatory pathway. The compound, called Adrenergic, is currently just in Phase 2 development, but it could prove to be a growth driver down the road. Having a deep-pocketed (and highly acquisitive) company like Allergan helping to foot the bills of clinical trials isn't a bad thing. With the company's share price in the stratosphere, management hasn't been shy about selling equity to raise additional funds. That's likely a smart more considering that successfully commercializing a drug doesn't come cheap. Still, all the secondary share offerings have caused the number of shares outstanding to rise quickly over the past few years. Mix that with the company's share price, and its market cap is currently hovering around $3.6 billion. Thankfully, all of these share offerings have put the company on solid financial footing. After selling an additional 10 million shares in January 2016, the company now has about $496 million worth of cash of its books. That should give it plenty of firepower to commercialize Nuplazid and fund the rest of its pipeline for at least a couple of years. So, there you have it -- bulls think Nuplazid is going to be approved and revolutionize the way we treat PDP. That might not be that far-fetched of an assumption since a few days ago, a FDA panel of outside experts voted 12 to two in favor of approving Nuplazid, stating that the potential benefits of using the drug outweigh its risks. That's a great sign, and it bodes well for the drug's chances when the FDA issues its final ruling, which is currently scheduled for May 1st. For that reason, it might not be so crazy to buy a few shares -- even way up here. Pharmaceutical buyouts often occur at two to three times peak sales estimates, and with Acadia currently trading around one times peak sales, there could still be room for substantial upside from here. That is, of course, if everything goes according to plan. 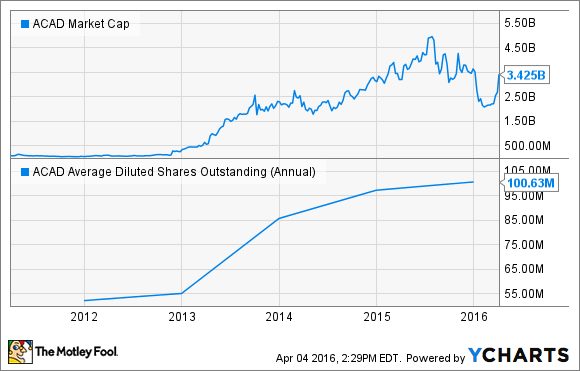 The Smartest People on Wall Street Are Buying These 3 Stocks -- Should You?